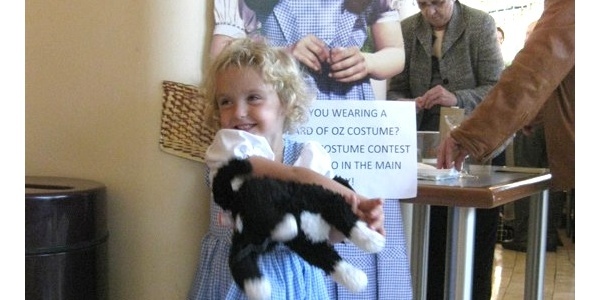 She has already been Dorothy before. 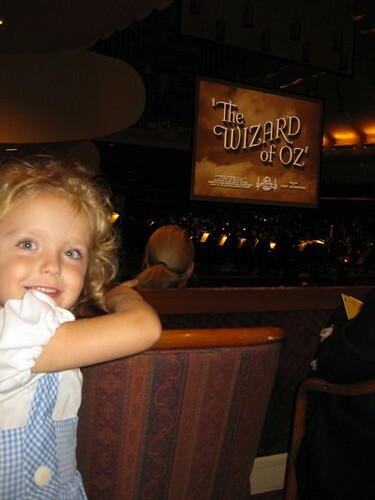 Then, we were invited to the San Francisco Symphony night with The Wizard of Oz! 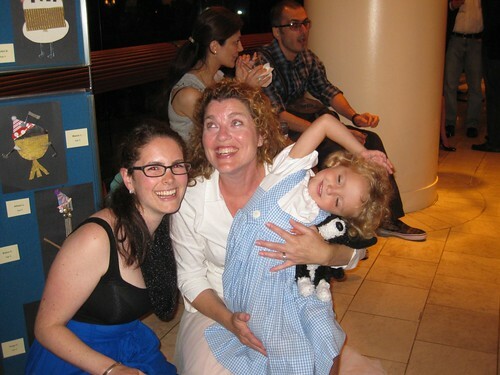 And it was time for another Dorothy dress. I decided to forge ahead without a pattern (for the dress part). I’d like to give you the opportunity to make one for your little (or not so little) Dorothy. You could easily just take any puffy sleeve white top out of her drawer and just use that. Unless otherwise noted use a 1/2 inch seam allowance throughout this project. Prewash all your fabric. There are three basic elements to this dress; the skirt, the waist band, and the straps. Skirt: Summary: Cut two long strips of fabric. Sew them into a tube. Cut two long swaths of the gingham. (Ours is 45 inches long on each side. So the skirt is TWO 45 inch long pieces.) 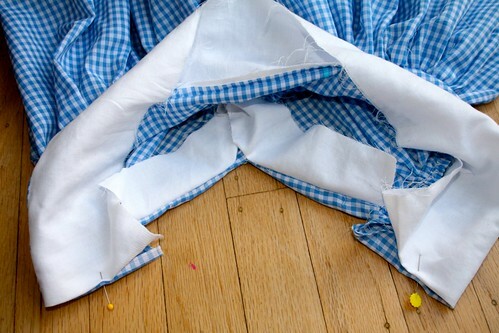 Cut your fabric to the length and width you need for your Dorothy. Just keep in mind, the wider the fabric, the more fullness in the skirt. 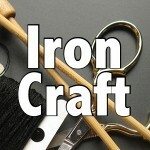 (Typically, the rule of thumb is to have twice as much fabric for gathers. I have gone way over that ratio here.) 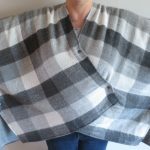 Sew these two pieces together at the short sides. Press the seams open. I did not want the seam to be the middle of the front. So the seams will rest on the hips. Then you will need to make a little cut in the back to help make the opening bigger. In the middle of the piece that will be the back, sew a little dart. It should run about 6 inches long, and be about 1 inch wide at the top. Later you will cut this dart open in the back, and make this where you get in and out of the dress. Next, we are creating the gathers. Dial your machine up to a big stitch, and run it along about 1/4 inch from the top edge of your fabric. Leave long thread tails, so you have something to pull on. You are now going to take a lot of fabric and gather it up. I found it helpful to keep track of where all the fabric was bunching before I started. Fold your piece in half, and using dress maker’s chalk or fabric pen, mark the center of the skirt. The seams mark the hips. Now for the fun: gathering. Use the bottom threads (the bobbin threads) and pull the skirt into a gather. 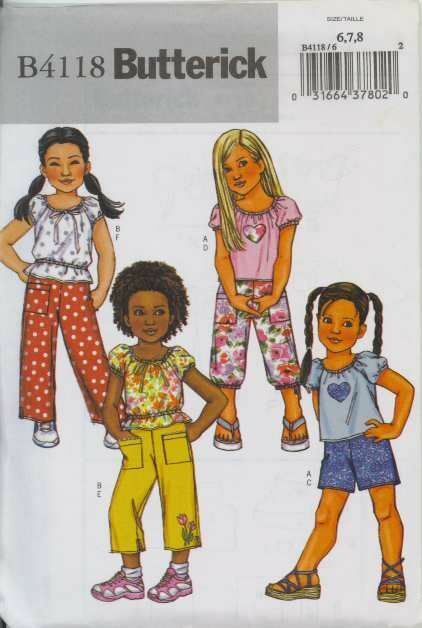 You will have lots of fabric, so try to keep the gathering evenly spaced around the garment. The marks you made will help you. Cut two strips each 2.5 inches wide and 7 inches long of the white fabric. Cut open a section of the dart that you made in the back of the skirt. Sew a white strip to each side with right sides facing, turn and press. The waste band: This is really a major piece of the dress. Ours is 4 inches long, and 25 inches around. 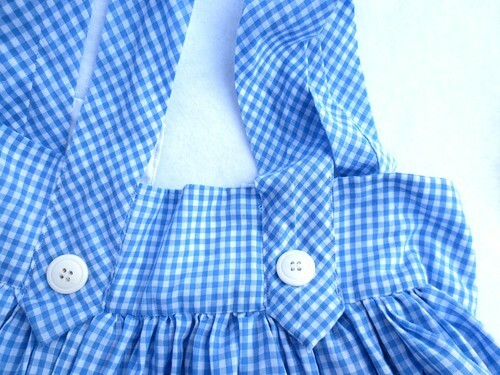 You’ll need 2 pieces of fabric, a white lining piece and a blue gingham piece. This is the part that needs a little bit of accurate measurement. And on a 3 year old, this part goes around the rib cage (more than the waist, even though we are calling it a waist band), so allow plenty of ease in the measurements. I took the measurement of her mid section and added 4 inches for ease. Then add another 3 inches for the overlap/snap area and seam allowance. Step 1. 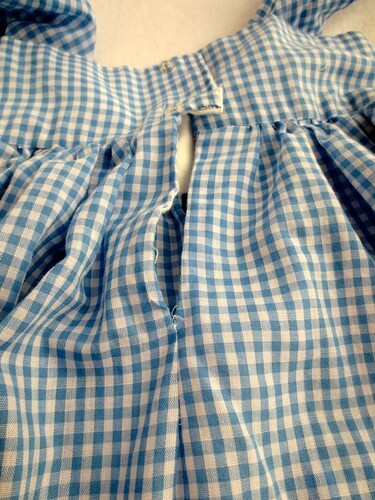 Sew the gingham to the lining along the long end of the strip with right sides facing. Step 4. 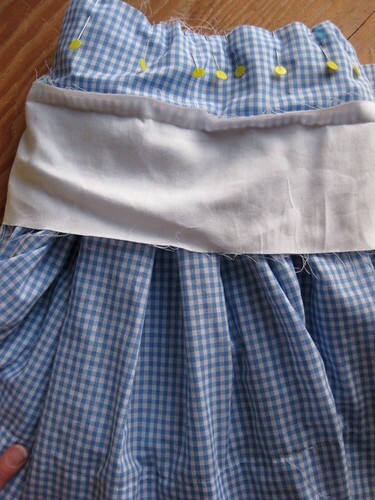 Sew the skirt onto the gingham portion of the waist band. Because you stitched your gathering row 1/4 inch from the top, if you use a 1/2 inch seam allowance, that will cover the gathering stitches, and hide them. 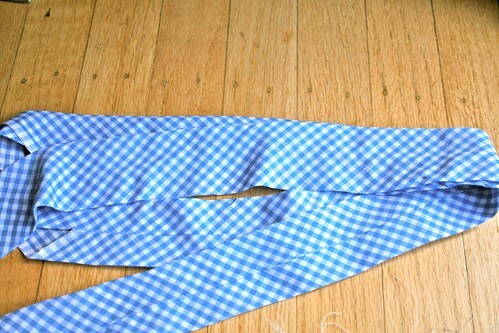 Straps: Cut your gingham into two strips 5 inches wide and 21 inches long (or length needed for size of your Dorothy). Sew these strips into tubes. Turn the straps inside out and press. To add a little detail, I folded the ends into a point and hand sewed them down. (Note: I hand stitched the straps down in the front with an invisible stitch and they did not hold very well. I recommend sewing them down with a close edge stitch on your machine. It will be easier to do this before the buttons are on the straps. ) In the front, the straps are sewn to the outside of the dress. In the back, the straps are sewn down to the inside of the dress. For strength, I sewed them down for about 4 inches. So, it’s a good thing I made them so long. Sew the button to the middle of the strap. Add your favorite dog. And a basket if you can manage it. This is a quick dress to sew. I don’t recommend doing it in 3 days. But it was a fun project. 7 years ago by Susi in Crafty Mom , Halloween , Holiday , Needlecraft , Projects , Sewing , Sewing Projects | You can follow any responses to this entry through the RSS feed. You can leave a response, or trackback from your own site. 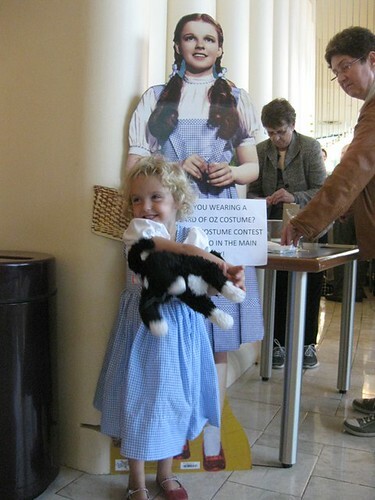 I wish I had pictures of me as Dorothy. Unfortunately, none exist. I deeply regret that. Yay for Dorothy. 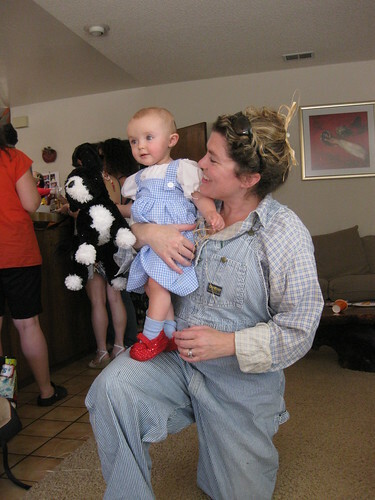 But have you taken your little Dorothy’s suggestion that you dress as the Cowardly Lion and Daddy dress as Tin Man. Dorothy needs an entourage.